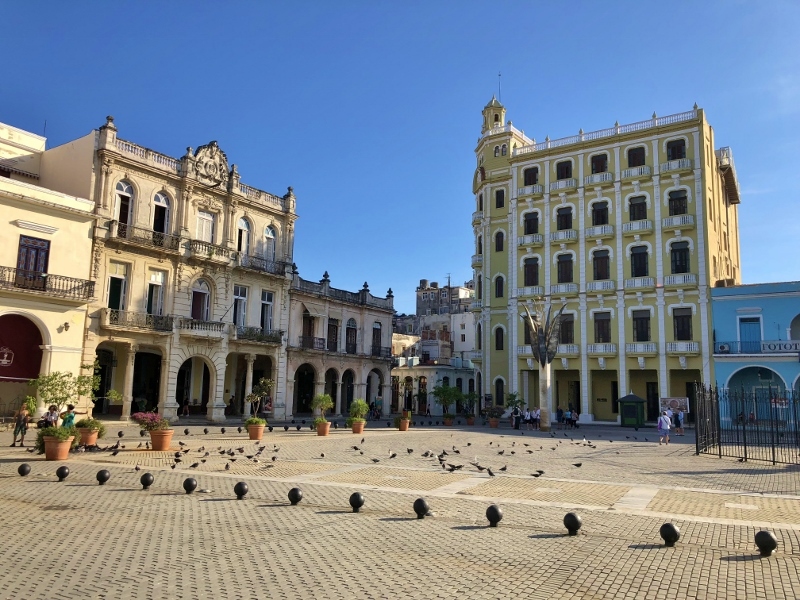 Old Town Havana is made up of four plazas. 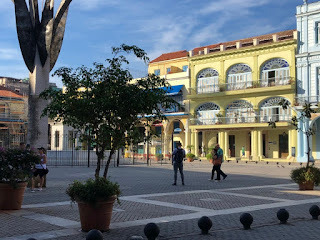 After exploring the San Francisco Plaza, our walking tour took us to the Plaza Veija. This square seemed much larger than the first and perhaps a little newer although that could have been due to the restored buildings. On one end of the plaza was of course a church. Our guide talked with us a bit about what is one of the main religions, Santeria. While the church is Catholic, it also accommodates those who worship a combination of Catholic saints and African deities. Santeria focuses on building relationships between human beings and powerful but mortal spirits called orishas which are considered a manifestation of God. Those who follow believe that these spirits will give them help in life if they perform the appropriate rituals. The orishas will then enable them to achieve what God planned for them before they were born. There is a Roman Catholic element in all this. Orishas are associated with Catholic saints. For example St Barbara/Shango, Our Lady of Charity/Ochun, Saint Lazarus/Babalu-Aye. Followers of Santeria are often in attendance at Roman Catholic services. The rituals of Santeria that enable followers to stay in touch with the orishas involve drumming, dancing, speaking and eating with the spirits. Apparently the spirits "seize the head" of a follower allowing for the communication to be possible. There is also some animal sacrifice involved but it is mainly to prepare food for the orishas. Members join as adults after receiving what they say is a call from an orisha. There is an initiation period for those who are called to be a priest or priestess in which they must go through four initiation rituals earning several items (like a beaded necklace) along the way and then wear white for a year while not having any physical contact with others not in the faith. I have probably simplified the explanation of Sangeria too much but it all points to why we were told to avoid those who were wearing white and not take pictures as it would interfere with their initiation. 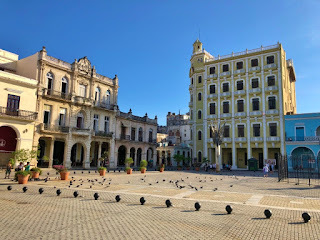 The Plaza Vieja was built actually to be a market place when the worshipers at San Francisco said that the market place in that plaza was so close to the church that there was too much noise. When the old Plaza Vieja was restored, they outlined the places where market booths were. You can see the squares marked off in the picture. 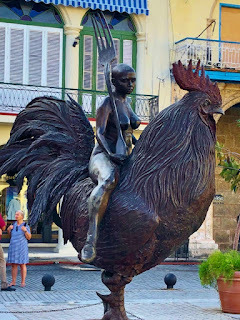 One of the more unusual statues we found was the rooster with a woman riding it carrying a huge fork. Our lecturer on the ship had said it was symbolic of wanting to feed the family but our tour guide (a female) said it was to illustrate how a woman rules the home.